Barbara Wilson and Pamela Myers both teach private instrumental lessons. Pam is very good with the young and old alike, beginners. Her specialty is piano, guitar, banjo and mandolin. Special emphasis is placed on note reading and music appropriate for the age level. 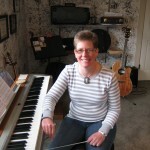 Other instruments listed are taught by Barbara, as well as more advanced piano and guitar. Both studios are in a homey, cheerful environment, close to downtown Crawfordsville and the Wabash College Campus. Each month students are recorded and after 6 months a CD is produced to note improvement. This also serves as motivation for practice. Recitals and participation in the National Federated Music Club Festival is optional, but encouraged. Two recitals are presented each year (March and June). The summer recital is held in Crawfordsville's historic Lane Place Gazebo where the students perform in groups. Hours are Mon-Fri 3-9pm during the school year and 9am-3pm in the summer. Adults and home schooled students can be scheduled Wed mornings. Barb and Pam are both active in area bands, including the Montgomery County Civic Band, the Lafayette Citizens Band and the Covington Band. Barb also plays double bass in the Lafayette Symphony Orchestra. Both teachers perform in ensembles as well. Barb has a brass quintet (playing trumpet) and Pam, a woodwind quartet (playing bass clarinet). Barb holds BME and MME degrees from the Jacobs School of Music, Indiana University. For six years she was a high school band director. She now serves as director of the Wabash Ave Presbyterian Church Choir. Pam studied music at Ozark Bible College and was active for many years teaching adults in the electronic field. She joined Music on Grant Studios in 2009 and has steadily built a large following of students, young and old. All instruments, as listed above, are taught. Note reading skills are emphasized with use of notespeller books to coordinate with instrumental method books. Music theory, sight-reading and ensemble playing are also taught. Lessons are usually 30 minutes in length, but hour lessons can be purchased as well. $21.00 per 30-minute session is charged. Usually one session per week is standard, however, more sessions, if available, can be scheduled. Since two teachers are on staff, siblings can take lessons simultaneously. Parents can be present during the lesson or relax in comfortable seating nearby. Cash or checks are accepted. Lessons can either be paid weekly or in advance. No set term is required. Proper notification, in a timely manner, must be given if the student is unable to attend the lesson. All ages are accepted. Trial lessons may be scheduled to determine readiness. Usually by the time a child enters school and is accustomed to structure, he or she should be ready to begin an instrument. Adult students are welcomed! Many adults regret not having music lessons as children and are fulfilling their "bucket list" later in life. Studies have proven the benefits of older adults who take music lessons. As with children, participation in recitals is optional, but encouraged. Both Pam and Barb have received the coveted Arion Award for outstanding musical achievement. Pam also was awarded the John Phillip Sousa Award, a top band recognition. Barb served on the board of directors for the Indiana University Music Alumni Association for 2 years and has been active with the Lafayette Symphony for nearly 30 years. Both teachers serve as adjudicators for the National Federation of Music Clubs Festival which is held annually. Barb was influenced early in life by her Nana, who was an accomplished pianist. Nearly all of Barb's family members played instruments. She began clarinet in grade 4, trumpet and piano followed and while at Indiana University, learned the string and percussion instruments. The Indiana University Summer Music Clinic made a huge impact on Barb's decision to make music a career. Pam was influenced throughout her early years by music teachers in school and church. She performed throughout school both vocally and instrumentally (guitar and clarinet). Let others know about Music On Grant Studios. Did this teacher help you to learn? How long did you take lessons? Are you still playing music? Share any thoughts or stories you have so that others can know about this teacher!